Employment increased by 43,000 in March, driven by gains among youths. The unemployment rate declined 0.1 percentage points to 6.9%. Overall employment growth in Canada has been subdued since August 2013. Compared with March 2013, the number of people working rose by 190,000. Over this 12-month period, employment and the number of hours worked grew at the same pace, that is 1.1%. In March, employment rose by 33,000 among youths aged 15 to 24, while it was little changed for the other demographic groups. Provincially, employment increased in British Columbia and New Brunswick, edged up in Quebec and fell in Nova Scotia. There were more people working in health care and social assistance, and in business, building and other support services. At the same time, employment fell in agriculture. Public sector employment increased in March while the number of private sector employees and self-employed was unchanged. Employment for people aged 15 to 24 rose by 33,000 in March, but their unemployment rate remained at 13.6% as more youths participated in the labour market. Compared with 12 months earlier, both employment and the unemployment rate for this group were little changed. While there was little change in employment for men and women aged 25 to 54 in March, the unemployment rate declined 0.2 percentage points to 5.7%, as fewer people in this age group searched for work. Employment was also little changed for men and women aged 55 and over in March. Nonetheless, employment for this group has risen by 3.4% (+114,000) since March 2013, virtually all the result of population ageing. The unemployment rate for this age group was little changed at 6.0% in March. In British Columbia, 18,000 more people were employed in March, pushing the unemployment rate down 0.6 percentage points to 5.8%. Prior to this increase, British Columbia had seen little employment growth since the autumn of 2012. Employment in New Brunswick rose by 3,200 in March, and the unemployment rate was 9.7%. On a year-over-year basis, employment in the province was up 5,600 or 1.6%. Following a decline in February, employment in Quebec edged up by 15,000 in March, and the unemployment rate was 7.6%. Compared with 12 months earlier, employment in the province was up by 31,000 (+0.8%). There were 3,400 fewer people working in Nova Scotia in March, and the unemployment rate was 9.3%. Compared with the 12 months earlier, employment in the province was down 9,100 or 2.0%. In the Prairie provinces of Manitoba, Saskatchewan and Alberta, employment was little changed, but an increase in the number of people searching for work pushed their unemployment rates up to 5.7%, 4.5%, and 4.9% respectively. However, the unemployment rates in these provinces remain the lowest in the country. Employment in health care and social assistance increased by 24,000 in March, continuing a long-term upward trend. In business, building and other support services, employment rose by 15,000 in March but was little changed from 12 months earlier. There were 12,000 fewer people working in agriculture in March, bringing employment declines in the industry to 24,000 (-7.5%) since March 2013. Public sector employment increased by 39,000 in March, with most of the gains in health care and social assistance. On a year-over-year basis, there was little change in the public sector and in self-employment, while the number of private sector employees was up 206,000 (+1.8%). The Labour Force Survey also collects labour market information about the territories. This information is produced monthly in the form of three-month moving averages. The following data are not seasonally adjusted; therefore, comparisons should only be made on a year-over-year basis. From the first quarter of 2013 to the first quarter of 2014, employment in Yukon increased by 900 and the unemployment rate fell from 7.6% to 5.9%. Over the same period, employment was little changed in the Northwest Territories. The unemployment rate was 8.1% in the first quarter of 2014, also little changed from a year earlier. 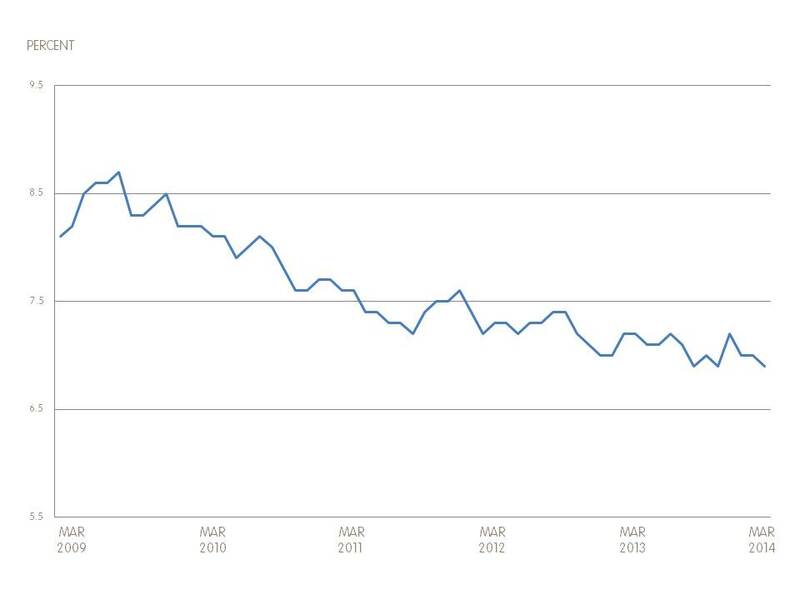 In Nunavut, employment was virtually unchanged in the first quarter of 2014, and the unemployment rate was 12.5%.